Audio-Technica ha anunciado la introducción de su tornamesa direct-drive AT-LP120-USB, un tocadiscos USB de calidad profesional y software digital. La nueva tope de linea es resistente y duradera para satisfacer las demandas de uso profesional, ofrece a los consumidores la flexibilidad de disfrutar de la reproducción de vinilo de alta calidad y transferir fácilmente documentos de archivos de medios digitales y CDs. 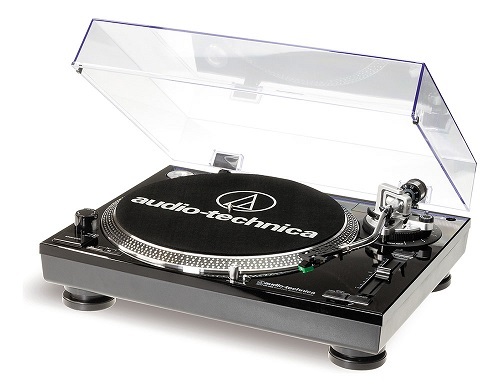 Audio-Technica’s AT-LP120-USB direct-drive, high-torque professional turntable is perfect for DJs and other music enthusiasts, especially in an era that many would call “postvinyl,” when it’s no longer the norm for audio/video receivers or even integrated amplifiers to offer a dedicated phono input. 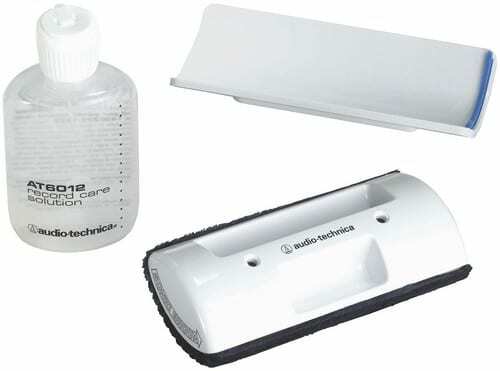 Connect the Audio Technica ATLP120 to your computer to digitize your old LPs (laptop not included; see larger image). It also includes a selectable internal stereo phono preamplifier and a USB output that connects directly to your computer–perfect for digitizing your old LPs to high-quality MP3 or FLAC files for playback from your computer. USB cable and adapter cables are included, along with Mac- and PC-compatible Audacity software to digitize your LPs. The AT-LP120’s S-shaped tone arm assembly comes with an adjustable counterweight, an antiskate adjustment, a tone-arm height adjustment and lock, a tone-arm lift with hydraulic action and lift lever, and a tone-arm rest with a locking mechanism to keep the arm stable during transport. The turntable uses a DC servo motor to maintain accurate rotational speed at either 33-1/3 45, or 78 rpm, governed by a selectable, high-accuracy quartz-controlled pitch lock–all of which gives new life to 7- and 12-inch singles you may not have played for years. Unleash your inner DJ with the ‘table’s pitch-adjustment feature, with variations ranging from either +/-10 percent or +/-20 percent. A pop-up stylus target light and stroboscopic platter speed indicator offer visual assistance in queuing and playing your favorite tunes. Forward and reverse play options unlock countless creative doors. The turntable comes with a cast-aluminum record platter, a slip mat, and a professional cartridge and headshell (model ATP-2) that plugs directly into the tone arm. Adjustable, antivibrational feet keep the platter level, regardless of your environs. A start/stop button with remote start/stop input lets you integrate the player with your more sophisticated DJ tools. 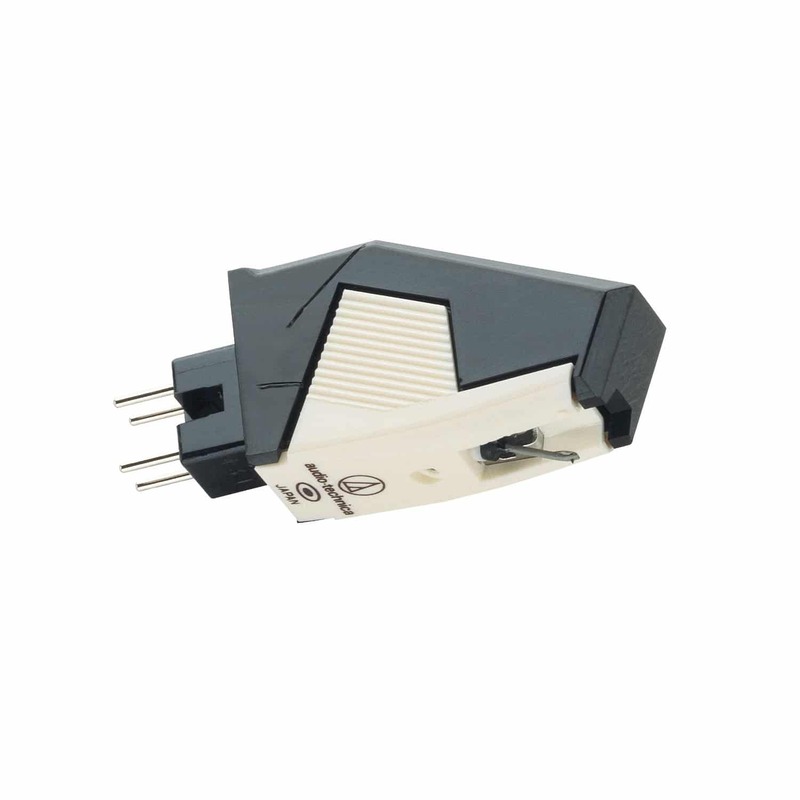 The player also includes a 45 rpm adapter with storage receptacle for the adapter and for a surplus or replacement headshell (sold separately). 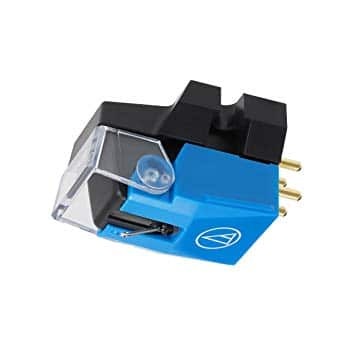 Turntable, removable hinged dust cover, slip mat, headshell/cartridge (ATP-2), AC power cord, 45 rpm adapter, USB cable; adapter cables, Audacity software (compatible with Mac and Windows), operating instructions. 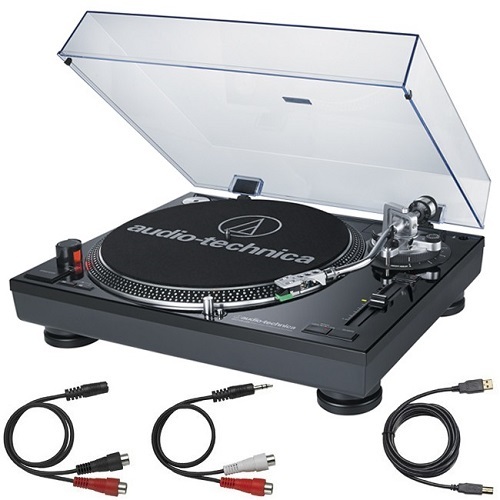 The Audio Technica AT-LP120 USB features a high-torque direct-drive motor for quick start-ups and a selectable internal stereo phono pre-amplifier that allows the turntable to plug directly to computers and other components with no dedicated turntable input. With a dedicated USB output, interfacing with your computer has never been easier. This is the all-in-one solutions for archiving or transferring your LP collection directly to your computer. Other key features include: forward and reverse play capability; cast aluminum platter with slip mat and a start/stop button with remote start/stop input; three speeds 33/45/78; selectable high-accuracy quartz-controlled pitch lock and pitch change slider control with +/-10% or +/-20% adjustment ranges; and removable hinged dust cover.